Sometimes, the textbook way isn’t always the right way. That’s what David Moyes and Everton found out and in the end, they were outdone by a stunning volley from Robin van Persie. The goal didn’t look like coming in the second-half – while Robin van Persie had one of his most ineffective games yet this season – and that was due to the turnaround in tactics by Moyes. Everton actually rode their luck in the first-half as Arsenal contrived to spoil good openings. First Theo Walcott delayed too long a pass to Gervinho before it was cut out while Aaron Ramsey chipped over when he could have finished first time. The positive to take from it though, from The Gunners perspective, was that they were able to pick gaps through a normally bullish Everton defence but lacked polish in the execution. That made it a frenetic first-half in comparison to the second, which Arsenal lumbered through before van Persie’s goal. That the goal came as it did was surprising although the build up consisted of what Arsenal did well in the first-half; quick interchange in central midfield before a blink-of-an-eye pass to find the run of a striker. Robin van Persie’s movement was brilliant; his strike even better but the pass that led to the goal will continue to go underrated. Though, the fact that it came from Alex Song shouldn’t be a surprise considering he attempted 7 through-passes in the game and the figure is a great testament to how far he has come. It wasn’t just the urgency he brings in possession, he has a balletic-like grace which covers the field and breaks up many opposition attacks. Proof that his unassuming style goes unnoticed, The Sun only gave Song a 7 for what we see as a man-of-the-match performance while the more visceral impact of Walcott and van Persie saw them receive 8 and 10(!) respectively. Good technique, though while widely accepted as an essential weapon, is rarely seen as a game-changing factor in the grand scheme of a result. Having good technique usually means simply being able to control the ball easily, weigh passes appropriately or maintain one’s balance when shooting. Occasionally, however, technique is the difference between winning and losing. Robin van Persie’s expert strike came as a sucker-punch to Everton as it undid all their hard-work to correct their faults in the first and after that, they never had the energy to get back in it. Truthfully, though, they should have been out of it in the first 45 minutes as they simply allowed Arsenal too much room. It wasn’t meant to happen that way but the way modern footballers have been programmed tactically, it happened habitually. David Moyes wanted Everton to play compactly and thus squeezing the space for The Gunners in their half. But to remain compact, it means the team moving together as a unit and as the textbook says, that means the defence has to push up. We all know by now, however, that to play against Arsenal, you cannot give them space behind and Everton did that constantly in the first-half. Phil Jagielka and Johnny Heitinga were unable to get close when the ball was played quickly around the corner but fortunately for them, they weren’t punished. In the second-half, however, they dropped deeper and that extra 5m they had spare, they were able to survey the threat better and anticipate the passes. That figure is shown by the dramatic rise in interceptions, which was only at a lowly 7 in the first, going up to 17 in the second. Denying Arsenal of that out-ball down the channels, Everton were able to frustrate Arsenal and prevent them from finding any fluency. David Moyes said: “The high line wasn’t necessarily the plan but we wanted to limit Arsenal and that means midfielders have to go and get close to Arsenal’s midfielders. If you do that then the back four have to move up too. We wanted to disrupt Arsenal’s passing and win the ball early. If we came and parked the bus you would be saying why did we not have a go, well we did, and if you do that you are always going to give Arsenal some opportunities. <Figure 1> Everton failed to get compact in the first-half and simply allowed Arsenal too much room to play through the middle and into the channels. As a result, their interception count was at a low 7. In the second-half, they dropped deeper and were able cut off Arsenal play and frustrate them. To highlight the effectiveness of the change, Phil Jagielka made all five of his interceptions in the second-half. Linked to Arsenal in the summer, does his preference for the deeper game indicate why Arsenal weren’t fully convinced by him? While it may fall down partly to Everton’s tactics that Arsenal looked more potent in the first, their expert ball rotation also allowed them to dominate as they did. Aaron Ramsey was given a “free role” to get to the end of Arsenal’s attacks and roam around the front-line for the ball. It was a typically energetic performance from the Welshman and it’s interesting that Arséne Wenger has pushed him up higher in the last few games. It’s a tactical role as he often has to mark the first midfielder to stop the pass out of the defence but, in the coming games, the role might have just become more important. 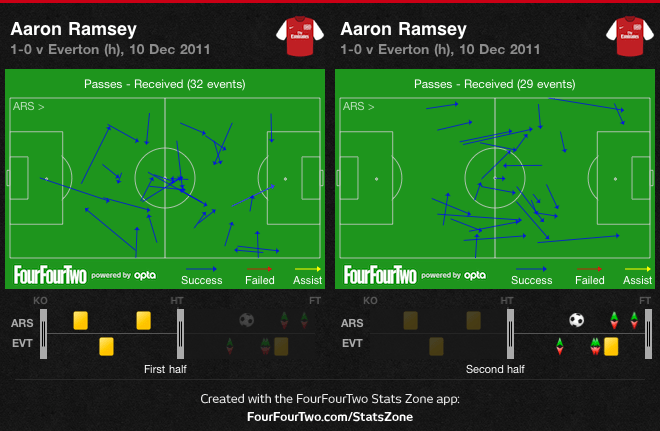 <Figure 2> The effectiveness of Arsenal in the first-half in comparison to the second can be displayed by the passing received charts of Ramsey. In the opening period, he as able to roam around the pitch in search for possession, rotating eith his teammates before getting on the end of moves. In the second-half, his movement remained almost exclusively to the middle showing how Everton disrupted Arsenal’s fluency. The reason why Wenger is more willing to push him up the pitch might be due to the lack of penetration provided by the full-backs. Of course, being central defenders by trade as they are, getting forward and providing the width can only be expected to be a secondary duty so extra drive has to come from elsewhere. Therefore, Wenger feels he can afford to take the risk and commit an extra body forward because he’ll have two cautious full-backs back anyway. As a result in this encounter, Everton were able to get plenty of room down the flanks, getting into a number of one-on-one situations but failing to deliver dangerously. 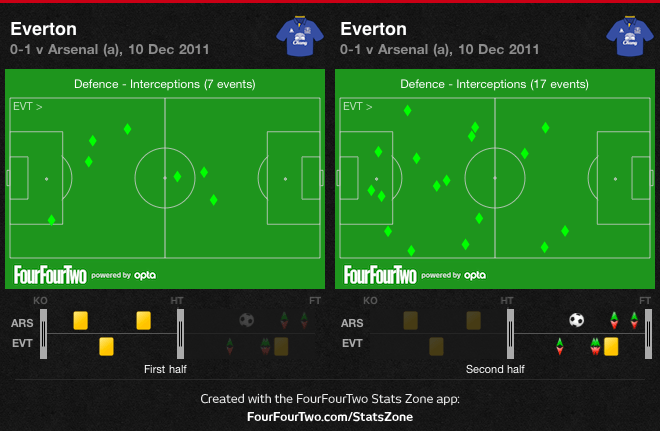 (Everton made more crosses than Arsenal but were poor on one-on-ones, only getting past 3 out of 8 times in wide areas). 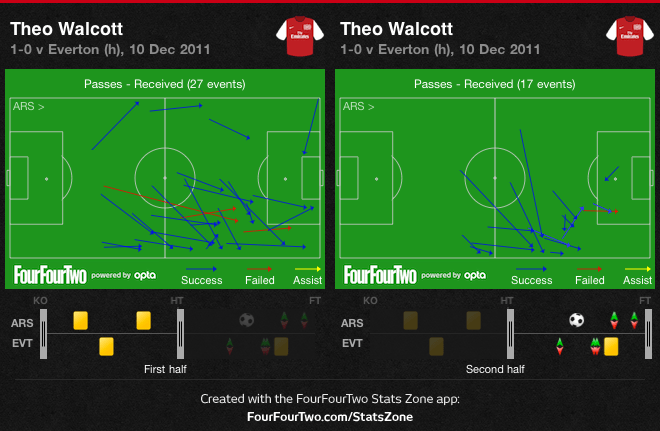 <Figure 3> Again, the compactness of Everton in the second period can be shown by where Theo Walcott recieved his passes. In the first, and Everton playing a high-line, he was played in more often behind the defence. However, in the next period, he was forced to drop deeper in search of possession.